With so many retailers offering pre-Black Friday sales, Thanksgiving Day sales and of course Black Friday deals, you might have forgotten about the upcoming Cyber Monday sales! 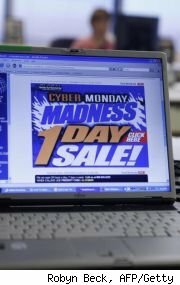 Even though many stores are trying to keep their Cyber Monday sales under wraps until after Black Friday we found several places to go looking for the best bargains on Cyber Monday. First off is the CouponShack which has a large collection of Cyber Monday coupon codes for Kohl's and many other small retailers who are offering Cyber Monday specials. RetailMeNot is another great place to look for Cyber Monday discounts. The RetailMeNot Cyber Monday page currently has some coupons from last Cyber Monday mixed in but there are still some geed deals to be found. You can also install the browser toolbar for FireFox or Internet Explorer and be alerted coupons for any store you visit. CyberMonday.com is offering a cool new service this year powered by Soundbite to send you text message alerts for Cyber Monday deals. To sign up for the alerts you need to text "Cybermonday" to 77053 and you'll get deals from top retailers. To stop the messages you can reply with "Stop." Another great place to look for Cyber Monday deals is Twitter. Several retailers are already tweeting coupon codes for special deals. Finding new Cyber Monday deals on twitter is as simple as searching for #cybermonday. If you want to look for a specific store just type the store name in the search box and you'll receive specific store results. You don't even need to be a Twitter user to search for the deals. After the Black Friday deals have expired more retailers will announce their Cyber Monday specials and coupons, so check back after Black Friday for more Cyber Monday sales.